I love going to the park with my lovely kids. The top paint is an acrylic Painting on paper of the trees in the park. I loved the way the light hit the top of the leaves but the rest of the tree was dark and in shadow. The sky was a such a deep blue blue colour in some areas with only a few clouds. I think trees are one of my favourite things to draw. 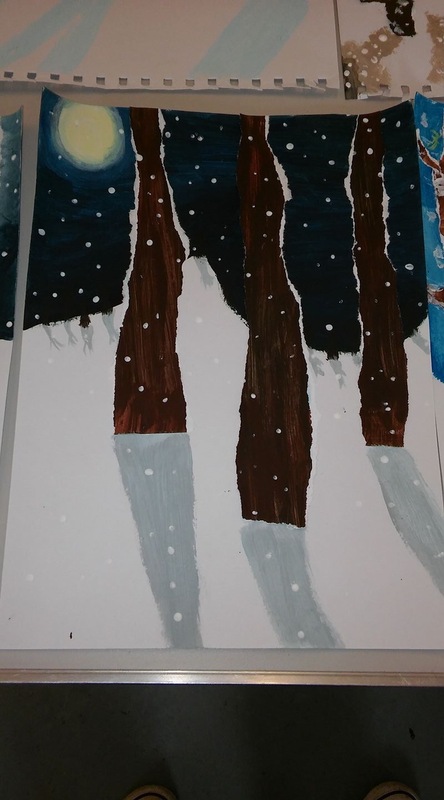 The picture below is of the snow and the trees from a beginners art class I joined late last year. It really helped to get me drawing and painting again. Again I love contrast. The white snow and the dark, dark sky and trees. Follow me on Instagram: www.instagram.com/chrissyturley30 to keep up to date with all my paintings and drawings. If you would like to see or purchase some of my work please visit my etsy store https://www.etsy.com/uk/shop/ChrissyTurleyArtisthttps://www.etsy.com/uk/shop/ChrissyTurleyArtist. Previous Previous post: Art and Tantrums……. Next Next post: Triathlete in training.